Maybe you noticed last week, the 13th one of the season, that the NFL actually let its players break a rule. In a sanctioned move, the NFL allowed players the option to wear custom-designed cleats that touted their favorite charity. Among the many cool styles and causes, I was certainly drawn to what some Philadelphia Eagles players decided they would promote, or rather, WHOM they would promote. Now I have to tell you I am somewhat partial to the Eagles because a neighbor of ours happens to be a stud member of their offensive line, he being #61 Stefen Wisniewski. For this reason I keep my eye on the Eagles and are generally happy when they win, except when in week 3, they humbled my Pittsburgh Steelers by a score of 34-3! 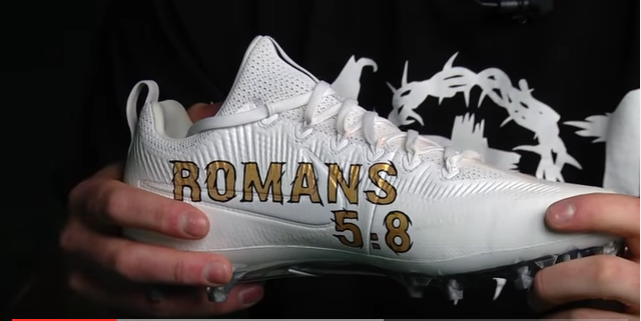 Now as for what was dubbed “My Cause My Cleats,” I was pumped to learn that Stefen and star rookie quarterback Carson Wentz and several other of their teammates decided to wear football spikes to honor one, Jesus Christ. These guys have sure footing and quite literally, are walking their talk. You are a powerful ambassador for Christ. Your Powe Gospel Posts are uplifting and an inspiration to many. I’m proud to be a part of your Family. Phil – I’m an Eagles Fan now!!! !